Ac Milan striker Gonzalo Higuain has said summer signing Cristiano Ronaldo is one of the reason he was shown the door at Juventus. 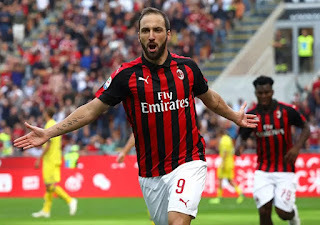 Juventus broke their transfer record to acquire the Portuguese international from Real Madrid in the summer and Gonzalo Higuan head to Milan on loan . The Argentina international reveal the problem all started last season when he was left on the bench for the Coppa Italia final where Juventus thrash Milan by 4-0. I did not want to leave ,but they force me out but as a professional footballer, you have to accept any situation you see yourself , i was not painful because my teammate and the make me feel like home .